Meh, that’s what I thought at first. Pride and Prejudice and Zombies was neither good or bad but just uninteresting and pretty boring. Then, it got ridiculous and really bad. I have to say, the only reason I finished the book was because I was reading it for a reading challenge and even then, I pretty much only skimmed through the last half. To be fair, I never read Pride and Prejudice and don’t have an interest in reading it but I thought, this version will be okay. I liked Little Women and Werewolves so why not Pride and Prejudice and Zombies? 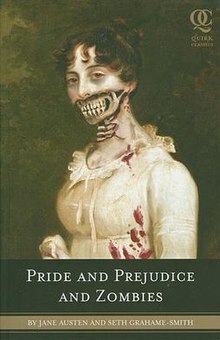 Liking zombies and liking modern regency romance novels and liking the Pride and Prejudice movies does not mean you will like this book, as I sadly learned last week. I do understand that this take is supposed to tongue-in-cheek and satirical but unlike many others, I didn’t find it enjoyable or laughable. To me, it was boring and humorless. First off, the novel is ridiculous. The premise of zombies in an early 19th century English society is something I would love to see. But Grahame-Smith’s zombie world doesn’t really change society all that much. The characters went about their lives with the occasional scrape with zombies and the ability to perform truly impossible physical feats in dresses and corsets. The one thing introducing zombies to England did right, was to highlight class differences. A lot of servants and lower classes died in this story. On the night of Bingly’s ball all of the servants were killed because someone left the back door open but not a single person above stairs even noticed or knew until they started wondering where dinner was. This aspect of that society was pretty spot on, but for the most part it felt like the zombies and the “oriental” cultural components were tossed in to shake things up. Having not read the original, I’m not sure how much Grahame-Smith added but I could tell you that the endless self-reflections of the characters, pages of internal monologue and self recriminations by Elizabeth really drew out the story in a very boring and unnecessary way. There were some scenes that just threw me off completely as being too outlandish and threw me out of the story badly enough to have me stop reading. Scenes such as using a living breathing horse as target practice for morning stars, deer wrestling (even though it was the only time animals were treated partially humanely), Elizabeth Bennet eating the heart of a ninja during a show of skills or her having a complete conversation while walking around on her finger tips and the whole duel between the two ladies was very off putting, and not because women can’t or shouldn’t duel because it was just weird. As an anthropologist, I am appalled and the lack of actual research done on the Japanese and Chinese fighting cultures that were incorporated into the story. From misusing weapons, cultural traditions, religious and honor systems, Grahame-Smith didn’t do enough research, even a simple Google search or looking at an encyclopedia would have cleared up some of these issues. I fully stopped taking the book seriously when Darcy’s housekeeper appeared hobbling around on bound feet, for several reasons. First, Darcy was schooled in Japan and his house and inspiration are derived from Japanese culture. They didn’t bind women’s feet in Japan. Second, even in China, foot binding was performed on young upper class girls, not women in the serving classes and given what I know of English 19th century society, a housekeeper binding her feet would be insulting to the upper class, she’s being uppity. Thirdly, I doubt any sane individual would purposely hobble themselves during a zombie apocalypse. Chinese history and beauty practices aside, we’re talking about a world where thousands die every day from diseased corpses trying to eat brains. They’ve been around for fifty years. Why in the world would anyone want to do that to themselves? They’re basically saying, I’m a great appetizer and would love to feed you my brains. Its preposterous and completely breaks the illusion.